When it comes to heating water for use around the home, most properties rely on a boiler to heat water as needed, or use a hot water cylinder. Alternatively, water can be heated using electricity, for example, in an electric shower or emersion heater. One type of system you may not know as much about is solar water heating systems, which use the energy from the sun to heat hot water in a hot water cylinder. Using solar energy from the sun to "pre heat" stored water has several benefits, helping us to use less gas, oil and electricity, saving us money and reducing the amount of carbon we produce. In the UK, a solar thermal hot water system will work all year round, although the clear, sunny days we (normally!) enjoy in summer are likely to result in more heat generated during these months and enough hot water produced to meet demand without further topping up. Where there hasn't been quite enough solar energy produced to heat water fully, especially in the autumn and winter months, a boiler or electric emersion heater can often be used to heat stored water further ready for use. 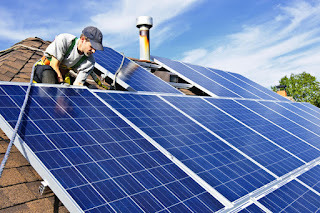 Solar thermal systems use solar panels, also called "collectors", which are mounted on the roof of a property and "collect" heat energy from the sun. These systems generally use two types of collector, each with their own advantages and disadvantages. While flat plate collectors are around 30% efficient, evacuated tube collectors are around 40-60% efficient but can be more expensive to install. How do solar heating systems work? The solar panels, or "collectors" in solar thermal heating systems house a network of tubes containing a mixture of glycol and water which absorbs the heat from the sun, warming the fluid up. The fluid is then sent through a coil in a hot water cylinder, warming its contents ready for you to use in a similar way as a boiler would warm up water in a cylinder. The temperature of hot water in the cylinder can be topped up from the boiler or using an electric emersion heater. Drainback system - This system pumps heat transfer fluid from a reservoir through the solar collector and then through a coil in the cylinder. Once the fluid stops pumping around the system, water from the solar collector drains back down into the reservoir, leaving the solar collector empty of fluid. Fully filled system - This system simply gets filled with heat transfer fluid at the testing and commissioning stage, then remains fully filled for the duration of operation or routine servicing. On average, a Solar Thermal Hot Water System costs around £3000 - 5000, but this will change significantly depending on the type of property, existing system installed and your property's heating demands. Most systems will generate moderate savings of £60-120 a year, however, the total savings to be made will depend on the type of fuel used previously to heat hot water. One of the most important factors to consider when deciding whether to install a solar thermal system is whether there is suitable space on your roof for a solar collector. Collectors should ideally be positioned on a roof that faces east to west and gets a lot of sun all day. An alternative to mounting a solar collector on the roof is to fit them to a frame and have them fixed to a south-facing wall. It's also necessary to think about whether your existing plumbing system is compatible with a solar thermal hot water system, and whether there's room in your home for an increased size cylinder. In addition, your boiler will have to be checked to see if it's compatible with the system, for example, combination boilers do not provide hot water to a cylinder and so cannot be used. If you decide a solar thermal heating system is right for you, find a quality installer in your local area by searching on our website at http://www.aphc.co.uk/find_an_installer.asp.